Women’s boutiques are liberally peppered throughout the Valencia shopping corridor in the Mission, but there isn’t a lot for men. And even though you can find men’s vintage clothing in the neighborhood, it’s hard to find new stuff that is stylish and fun, yet sophisticated. 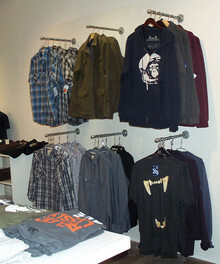 HANGR 16 on 16th Street near Valencia Street is making it possible for men to look as chic as the ladies. HANGR 16’s name comes from the space’s hanger-like shape, along with its location on this busy block in the Mission. 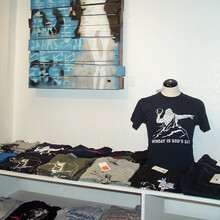 You’ll find a number of local brands, including the ubiquitous Headline Shirts, which carry funny and irreverent themes pulled from pop culture, politics, music and history, in addition to REVL skinny ties, and Gytha Mander silk ties. This is not a surprise as all of these lines are under the umbrella of Revel Industries, which was founded by Chris Gorog, also one of the people behind HANGR 16. In addition to popular local brands, HANGR 16 has a few other domestic brands sprinkled in, like Portland’s Bridge & Burn and Los Angeles’ life/after/denim. The inventory is pretty evenly split between men’s and women’s and the majority comes in under $100, though you can find many items for under $50. For men, outerwear includes a Bridge & Burn Berthoud wool coat in charcoal ($275), as well as the company’s Major Major Jacket in black ($242), and a life/after/denim military blazer in brown ($138). The most creative coat is the locally made Turk & Taylor Golden Gate Field jacket made of vintage army blankets ($220). There are also flannels from Coastal ($40), and tailored vests made of recycled material from Taxi CDC ($38). To complete the look, there are Goodsociety slim fit jeans ($120), which are fair trade and sweatshop-free, made of 100 percent organic cotton denim and natural dye. In addition, for every pair of Goodsociety jeans you buy, the company donates a quarter of its profits to various charities, so you can assuage some of your guilt after you’ve spent a bunch of money on new clothing. Of course, there is a wealth of T-shirts for men and women, most sporting the Headline Shirts brand name, including the Vader Piñata and Cold War Vet designs (both $24). There is also a selection from local brand GAMA-GO, featuring characters such as Death Bot ($28) and Squirrel Sammie ($28). For a little touch of panache, there are silk pocket squares ($20) and scarves, like one in black and white houndstooth check with blue backing from Gytha Mander ($70). 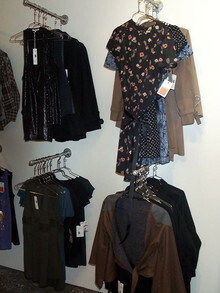 Women’s offerings include a Dickie’s black motorcycle jacket ($54), classic five pocket skinny jeans ($42), a Lamade Megan Cardi in green ($130), and a Love Brigade black and white revival dress ($98). If you like the recycled angle, Taxi CDC has created a redesigned trench coat and an 80s black and white mini ($96 and $84, respectively). Local designers with strong followings for women’s offerings include She Bible, with its classic dress in eggplant ($112), and Turk & Taylor, with a white Mt. Davidson snap blouse ($88). Perhaps you want to look stylish underneath? HANGR 16 has organic cotton underwear from another local designer, PACT. You can find thongs ($16), bikini briefs ($18), and boy shorts ($20) in purple shell or wave designs. Both of these undergarment patterns were created by Yves Behar, an industrial designer and founder of fuseproject, the San Francisco-based design and branding company. Finishing touches can be made with pieces from another local artisan, Kate Ellen of Kate Ellen Metals. Kate’s reverse etchings find their way onto delicate yet mechanical pieces such as her brass and sterling silver necklaces ($45 and $82). The owners want to tie the store to the community at a deeper level, such as through the support of local artists and designers, in addition to building relationships with local businesses. So, the space will not just be a clothing boutique, but it will also function as an events space. They’ve got a ridiculously large sound system and have already made good use of it for past events, including their opening launch party. Coming up next is a fashion show on the February 12th.